Golf cart troubleshooting can rescue a stranded golf cart and can often save you a lot of money. 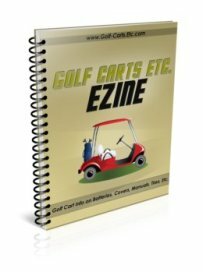 If you are the type that likes to figure things out yourself, then I suggest you have a copy of your golf cart repair manual handy. Always follow the instructions of the manual. Be sure to wear eye protection or goggles anytime you are working with your batteries - they are filled with acid. You want to start with the easiest and most obvious problem spots first. Make sure batteries are fully charged. 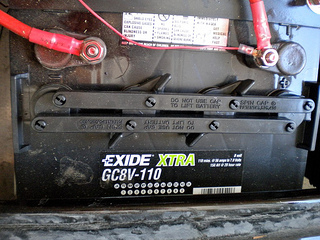 Sometimes deep cycle batteries can be discharged so much that they won't take a charge. This can happen if the cart has sat for weeks or months without any charging. In this case you will need to charge your 6 volt batteries with a 12 volt battery charger. Replace with distilled water - but do not overfill them. Check the terminals, posts and cables for golf cart battery corrosion, loose cables, or frayed cables. All of these can cause your golf cart to stop and start intermittently or to loose all power. My son-in-law's golf cart recently died on him. The batteries were showing a full charge. So the next place I checked was his batteries. Here is what they looked like. The terminals, posts and cables were thick with corrosion and some of the nuts had been eaten away. I cleaned up the corrosion on the battery cables and the posts by using a wire brush and a solution of baking powder and water. Guess what? After a little bit of clean up, the cart started right up and ran great. Battery cables are golf cart make, model and year specific - but it's a small investment with a big return. A new set of cables cost around $20. Electric golf cart repair is where I have had my experience since I have owned, regularly used and repaired my electric golf cart since 1995. Some of the more common repair questions usually involve the batteries, golf cart battery wiring, cleaning up corrosion, the starter and the solenoids. One problem I had for a while with my golf cart is that it would intermittently stop. Another time, my golf cart wouldn't go - it would just make a clicking sound. In both situations I found that the cart had a bad solenoid. The solenoid is the switch that allows battery current to flow to the motor on electric carts. This part frequently needs replacing because it has to work all of the time. It isn't just needed to start the cart, the solenoid works constantly whenever the pedal is pressed down. Think how often you stop and start your golf cart - each time the solenoid is engaged and eventually wears out. Replacing one can be done by a golf cart owner using common safety precautions and included instructions. Here's a great video on how to test your solenoid to see if it needs replacing.